Prominent & Leading Manufacturer from Bengaluru, we offer bopp self adhesive tape and bopp tape. We offer a wide range of BOPP Self Adhesive Tape that is widely used in carton sealing and stationary. 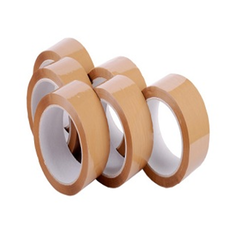 These tapes have cross-linked adhesive properties that provide internal molecule strength and elasticity. Known for their water resistant property, we are offering these tapes in various colors and widths at most competitive prices. We manufacture Polypropylene BOPP Tape using quality Bi-axially oriented polypropylene and are widely used for light to heavy carton sealing. The superior quality of these tapes has escalated their demand among our nation based clients.